These retreats and meditation centers provide places of respite from the cares and stress of everyday life. The retreats provide practitioners with the opportunity to draw upon their inner self and meditate upon the purpose of life. Many tourists come to Bhutan for meditation and retreat tours. 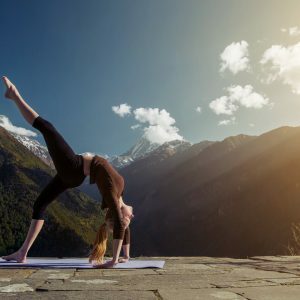 This itinerary includes some meditation programs & solitary retreats for few hours in the high hills and temples where the serenity and beauty of nature can be appreciated in undisturbed silence. On arrival at Paro airport, you will be greeted by Bhutan Rila’s representative. On completion of airport formalities, drive towards Thimphu. Next check-in to your hotel in Thimphuand sightseeing after lunch includes the Folk Heritage Museum; the Institute of the 13 Arts & Crafts of Bhutan and where you can interact with the students; and the Takin Preserve, home to Bhutan’s most unusual national animal. 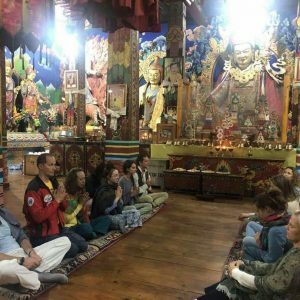 In the evening visit the TashichhoDzong/Fortress of the Auspicious Religion and office of the Golden throne of the Dragon King of Bhutan.Join Kevin in offering 108 butter lamps and long life prayers at ZangthoPalri Temple in Thimphu. Visit KuenselPhodrang and Soak in the panoramic view of the Thimphu valley from the site of the gigantic Lord Buddha, a 51-meter bronze Shakyamuni Buddha statue gilded in gold. 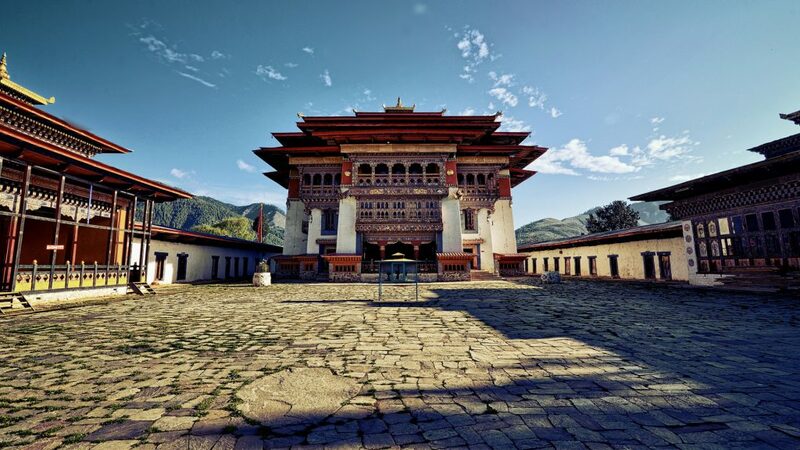 In the evening visit the impressive PunakhaDzong / Fortress of Great Bliss built in 1673 by ZhabdrungNgawangNamgyel (the first spiritual & political leader of Bhutan) to commemorate the final victory against numerous Tibetan invasions. Located on a piece of land between two rivers Pho Chhu and Mo Chhu (literally meaning male and female rivers), the Dzong is massive, huge and magnificent in all its architectural grandeur. Although ravaged by flood, fire and earthquakes many times, the Dzong was always rebuilt with its original pattern and design. The first King of modern Bhutan was crowned in PunakhaDzong. 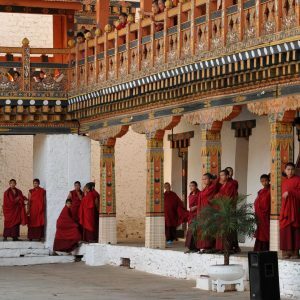 Important religious ceremonies are still held in the Dzong. The Royal Wedding ceremony on 13th October 2011 of the Fifth King JigmeKhesarNamgyelWangchuck to JetsunPema was conducted in PunakhaDzong. From the Dzong enjoy a short walk through a beautiful pathway of giant flowering trees and flowers and on to the longest iron suspension bridge. The Gangteng Monastery-generally known as GangteyGonpa is an important monastery of Nyingmapa school of Buddhism, the main seat of the PemaLingpa tradition. The Monastery’s history traces to the early 17th century and back to the prophecies made by the well-known Terton (treasure finder) PemaLingpa in the late 15th century. The present Abbot, KunzangPemaNamgyal is the ninth re-incarnation. The descent of the first king of Bhutan, UgyenWangchuck of the Wangchuk Dynasty of Bhutan, which continues to rule Bhutan is traced to the clan of the DungkharChoje, a subsidiary of the clan of KhouchungChoje whose founder was KungaWangpo, the fourth son of PemaLingpa. In the evening we will attend the closing ceremony of GangtengDrubchen at Gangteng monastery. Drupchen -literally “vast accomplishment,” is a traditional form of meditation retreat in Tibetan Buddhism that lasts for about ten days. It involves a large number of lay and monastic practitioners and is led by at His Holiness Gangteng Rinpoche.It is regarded as a very powerful practice, and is said to act as a remedy to the negative forces at work in the world, and to promote inner personal peace, peace within the community and world peace. This valley is a broad glacial valley (10’000 ft) on the flanks of the Black Mountains, Phobjikha with it’s gently slope is a place of astonishing beauty described as” the most beautiful valley in the most beautiful country of Himalayas”. Every winter, the rare and beautiful black-necked cranes return from Tibet to the Gangtey valley where they are protected. Today you will join the people of Gangtey valley to attend GangteyTshechu. Tshechu is a religious festival meaning “tenth day” held annually in various temples, monasteries and dzongs throughout the country corresponding to the birthday of Guru Rimpoche (Guru Padmasambhava). Tshechus are grand events where entire communities come together to witness religious mask dances, receive blessings and socialize. In addition to the mask dances, tshechus also include colorful Bhutanese dances and other forms of entertainment. On this auspicious day in Gangteng Monastery, we will offer 1000 butter lamps and then we will visit the monastic college or shedra, Do-ngagTösamRabgayling and receive one hour teaching on Buddhism and a short Meditation Session. Today in Gangtey we will make smoke offering and request a lama to bless us with Buddhist Cleansing Ritual (Sang pūjā is a profound Vajrayāna offering practice). The word Sang in Tibetan has the meaning of remove, take away; purified, cleared, cleansed and awakened. As such Sang pūjā is considered a purification practice and focuses on removing the impurities in the mind stream of the practitioners and all the ‘guests’ .The physical ritual involves the burning of different woods, incense together and many other substances such as ground gemstones and brocades that are described in the practice texts. We will also hoist Lungta Prayer Flags. Prayer flags are inscribed with auspicious and sacred emblems, symbols, and texts in the forms of invocations, mantras, and sutras. All of which are prayers and blessings. Prayers and blessings for long life, good fortune, health, wealth, peace. Prayers and blessings for happiness, prosperity, protection from harm, strength. Prayers and blessings for wish-fulfillment, luck, harmony, wisdom, merit, compassion.It is believed that when the wind moves prayer flags, even with the slightest breeze, these prayers and blessings become activated, and then are carried through the air in a spiritual vibration across the vicinity. Not only does the flag planter, but everything that is touched by the wind, and all sentient beings, benefit from the prayers and blessings that are carried by the wind. After this event we will hike through Gangtey Nature Trail back to the Hotel. Evening try traditional Bhutanese Herbal Hot Stone Bath in the Hotel. After breakfast drive to Bumthang.On the way Trongsa Dzong which was built in 1644, used to be the seat of power of the Wangchuck dynasty before they became rulers of Bhutan in 1907. Traditionally, the King of Bhutan first becomes the TrongsaPenlop (governor) before being named the Crown Prince and eventually the King. Built on a mountain spur high above the gorges of the MangdeChhu, the dzong controlled east-west trade for centuries. Trongsa also boasts an impressive museum. The watchtower of Trongsa has been converted into a museum dedicated to the Wangchuck dynasty and is a good place to learn about the history of the kingdom. After a typical Bumthang breakfast, visit the JakarDzong/Fortress of the White Bird and walk at a leisurely pace to the four temples of JambayLhakhang/temple, KurjeyLhakhang, Tamzhing and kenchosumLhakhang. All the monasteries are ancient and with their unique history and beauty. After lunch visit Tang Valley you have to drive from Jakar towards the west-east road that goes to Ura for 10 KMs. Then through the unpaved roads you will finally reach this beautiful valley. This is the road which can take you to the burning lake (Membartsho) and PemaTekchokChoelingShedra. You will visit PemaThekchok Nunnery join the nuns for a specially organized for your group- Chöd or Chod Ritual is a unique spiritual practice and a path to complete enlightenment, by cutting through attachment to the body to offer compassionate sacrifice, so that in wondrous application of wisdom and compassion all things unite. Chod is a powerful Buddhist tantric practice. In Tibetan Buddhist Tantra it is taught to beginners for accumulation of merits.It clears the karmic obstacles and blockages arising from our negative interaction with others in countless past lives, harming others through physical, verbal or emotional aggression results in a karmic seed, which ultimately ripens in various sufferings of body and mind. Chö or Healing Chod Puja is a unique spiritual practice and a path to complete enlightenment. Fly to Paro by domestic flight and later in the afternoon attend a session on GNH and visit a farm house to try traditional Bhutanese hot stone bath. After lunch visit Kyichu Lhakhang and RinpungDzong, this 15th century massive fortress/monastery, is also the administrative center of the dzonkhag and Ta Dzong. Built as a watch tower the Ta Dzong, it was converted into the National Museum in 1968. The museum boasts antique Thangka, textiles, weapons and armour, household objects and rich assortment of natural and historic artifacts. After breakfast drive upto Sang Choekhor and hike from Sang Choekor Buddhist College (2,800m) to Yak Pasture below Bumdra Monastery (3,800m). The adventure begins with an early morning drive up to the Sang Choekor to meet our ponies and while they are being loaded we may pay our respects at the College. The initial 1–2 hour ascent of a ridge can be steep at times but in cool shade. We will reach a clearing with prayer flags and enjoy a spectacular view of both Paro and Do Chhu valleys. About 1-2 hours walk away is the ChhoeChhoeTseLhakhang (temple); which nestles at the side of the mountain. The trail continues and when we reach the last steep elevation we will see a temple overlooking the views of Paro airport and the snow-capped Himalaya. After another 20 minutes of climbing through ruins and fluttering prayer flags, we hike into the ancient forest for about 40 minutes before we reach a wide meadow with sacred chortens and prayer flags. We will spend a night ata camp around Bumdra Monastery (the cave of a thousand prayers). It has an awesome view of the Himalayan mountain range. After lunch we can visit the monastery (if it is unoccupied) and climb towards the north of the peak (about 4000m) for a better view of the mountains before returning for dinner. After a hearty breakfast in the jaw dropping landscape, it is time to either head straight back into the valley or linger awhile soaking up the view and perhaps hang some prayer flags of our own. Eventually we have to drop back into the ancient pine and rhododendron forest on the monks’ zigzagging trail. After 1-2 hours of descent we catch glimpses of the golden roofs of temples below and soon come upon the first of many on our way back from the wilds. The path snakes across the mountainside between the monasteries and temples before reaching the gardens of Zangtopelri (Heaven on Earth) from which you can bravely peer over edge and straight down onto the ornate roofs Taktsang in the cliff far below. An hour later and we are at the gates of Taktsang looking across the gorge a steep descent to a waterfall then ascent on steps and you are passing into the Tiger’s Nest itself. Taktsang Monastery (or Tiger’s Nest) is the most recognizable sites in Bhutan. Built precariously on a hillside cliff, it sits more than 10,000 feet above sea level. Accessible only by foot, we follow a trail decorated with colorful prayer flags along the way to protect travelers from evil spirits. Built over the caves that Guru Padmasambhava meditated in for three years, this eighth-century father of Bhutan Buddhism is said to have been brought there on the back of a tigress. Later in the evening stroll through Paro town for last minute souvenir shopping followed by farewell dinner cultural Program.